So, what’s with that saying? Who says tomahto, anyway? No one I know. Those of you with upper-crust, Ivy League educations maybe. You know who you are. You’re the ones who probably say tomahto. Well, do you know what the Tariff Act of 1883 was? Hmm? Do you? Are there any agricultural history buffs out there reading this blog? Okay, Jon or Cindy, it falls on you to answer this one. Not exactly particle physics or nuclear fission or whatever it is you two are into, but since you’re the only ones reading this blog, it’s up to you. Or Tevis, who has a master’s in gothic literature or some obscure thing like that. At least I’m attracting an interesting cast of characters. Although Tevis’ interest is by default since we’re genetically linked by DQ2 (that “special” gene that predisposes one to celiac disease). I’m rambling, sorry about that. Back to 1883, when Congress decided to pass a rather innocuous law requiring a 10% tax on imported vegetables, but not on fruit. Along comes New Jersey importer, John Nix, who refused to pay the import tariff on his tomatoes, arguing that technically they were fruit. And he was right, in a botanical sense. This paramount case ended up going all the way to the Supreme Court (don’t they have better things to figure out) and the Court justices all agree that commonly tomatoes were vegetables and therefore subject to the same tariff as other vegetables. “Commonly” was the deciding factor, although “botanically” tomatoes are of the fruit family. And so it goes, the United States Supreme Court ruled that legally, a tomato is a vegetable even if it is a fruit. One hundred and twenty years later, our courts were still deciding monumental cases such as the vegetable vs. fruit case of 1883. In 2003 the United States Court of International Trade made a tariff determination between two types of action figures. Are they dolls or toys? Fruits or vegetables? Tariffs are higher for dolls than for toys. Geez, what’s the difference? Isn’t a doll a toy? Whoa, and what about those mutant super heroes? Are they dolls or toys? Or action figures? Or real people? Yikes, it sure gets confusing when lawyers get involved. As one of my favorite yoga instructors in the world always says (yes, that’s you Scott), “my point is (and I do have one),” tomatoes are high in nutritional value and a great way to add some color into your diet. Color is good. The more vibrant, the better. Tomatoes are rather trendy right now. Research on phytonutrients (plant nutrients) has shown that lycopene, an antioxidant found in tomatoes, helps prevent heart disease and some forms of cancer. Lycopene is a carotenoid and studies show higher concentrations are found in organic tomatoes than in their conventional counterparts. In fact, according to the folks at the USDA Agricultural Research Service, organic brands of ketchup also contained much higher levels of lycopene. The darker the red color, the higher the nutritional value. One brand of organic ketchup they studied (I don’t know which one) contained 183 micrograms of lycopene per gram of ketchup, which is about five times as much per weight as a tomato. One of the fast-food packets of ketchup contained 1/3rd the lycopene as the organic brand. But then again, any food you receive through the window of your car is probably not the best choice. And as always, whole tomatoes trump ketchup (even organic ketchup) in overall nutritional value. Plus, most ketchup is high in sugar, so go easy on the condiments. I occasionally use Annie’s Naturals organic ketchup (I love ketchup on scrambled eggs). Annie’s is gluten free and dark red in color, so if you can, go for the good stuff. The darker the red, the better. Back to tomatoes. Boy, I’m spiraling today; from mutant action figures to ketchup. I’ll try to sum this up. Tomatoes (lycopene) may help reduce the risk of prostate cancer and may also lower the risk of colon cancer. They are also an excellent source of vitamin C, vitamin A, vitamin K, and are a good source of fiber, potassium, folate, manganese, B vitamins, vitamin E, and they even contain some protein. Good stuff, these tomaytoes! P.S. 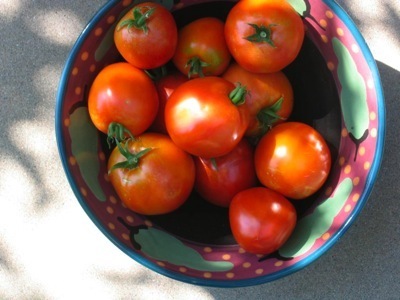 These yummy looking tomaytoes in the photo are right out of my generous neighbor’s garden. The best of the best! Thanks Ron! This entry was posted on Thursday, September 20th, 2007 at 3:21 pm	and is filed under Celiac & Gluten Intolerance, Super Foods. You can follow any responses to this entry through the RSS 2.0 feed. You can leave a response, or trackback from your own site.